“anti-WTO”, what are they against, anyway? globalised capital, is once against pressing towards our doors steps. again be held in asia. how then should we respond? In 2010, amidst heated opposition, the Legislative Council approved the funding for the construction of the Hong Kong section of Guangzhou-Shenzhen-Hong Kong Express Rail Link. The focus of the struggle of Choi Yuen Village, the major victim of the land resumption and clearance involved in the railway project, has then shifted to building a new village for themselves. Whilst fighting for an official license which allows them to purchase farmland and build houses, the villagers began planning the new village. From the design of every single house, to the ratio between private land, farmland and public land, every detail was discussed and decided collectively. Meanwhile, the government announced that the villagers had to move out in November 2010; however, due to the ‘Right of Way’ issues, the villagers were concerned about the possibility of commencing the construction of the new village on the piece of land which they were not sure if they had the right to pass through. The government started to tear down houses in the village in November. To fight for sufficient time for building the new village, the villagers formed daily patrols to stop the demolition. In May 2011, the villagers eventually left their homeland, in which they have lived for decades, and moved to temporary houses built on a farmland they purchased. 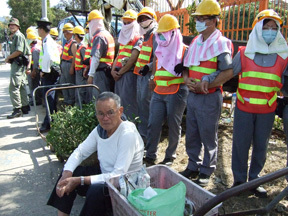 Despite all the obstacles, the Choi Yuen villagers demonstrated persistence and unity. The struggle and experience of Choi Yuen Village manifests new possibilities to the villages in the northeastern part of the New Territories that are now confronting land resumption and demolition; it also reminds us of the true hardship of a prolonged struggle of this kind which we should never overlook. The Sacrifice keeps track of the lives of the liquidators (frontline workers) since the moment of the Chernobyl catastrophe began. These liquidators tell us how the government officials tampered with their records of internal radiation, and how they were abandoned, forgotten and then became second-class citizens. While their voices might not be able to change the existing nuclear policies, will their stories be widely heard and understood? In 2012, one year after Japan’s nuclear disaster, while most Hong Kong people concerned powdered milk and sashimi made in Japan, the anti-nuclear campaign started by local community was at its peak. Japanese local media, ‘Labour Net Japan’ kept track of post-disaster situations: Video Summary of an Anti-Nuclear Protest recorded a protest in Tokyo three months after the Fukushima nuclear disaster, in which various organizations, young people in vehicles with audio device, farmers with cows and spinach, foreign friends and citizens who seldom participated in social movements, all went on the streets. The crowd made the police nervously armed. In The City Exterminated by Nuclear Power: Records of Refugees and Futaba Machi, one year after the disaster, the displaced refugees of Futaba-machi, Fukushima were interviewed. The film shows how the refugees have lived together in the refuge, how they were forced to leave their homes and the process of fighting for justice against Tokyo Electric Power Company. In the end, do humans have the capacity to take the risks and consequences of using nuclear energy? What can we learn from the films, to face the ever-growing problems of nuclear energy?